When we see how the darker side of populism has raised its ugly head in the UK as exemplified by its Brexit nightmare, France’s recent riots by yellow vest protesters over rising gasoline prices and the US democracy being led by an extremely flawed character, the republican President Donald Trump with the backing of impotent GOP lawmakers in the US Congress and their GOP ‘Dark Money’ corporate donors, we can legitimately point the finger at greedy corporate bigwigs who believe they can control the world. 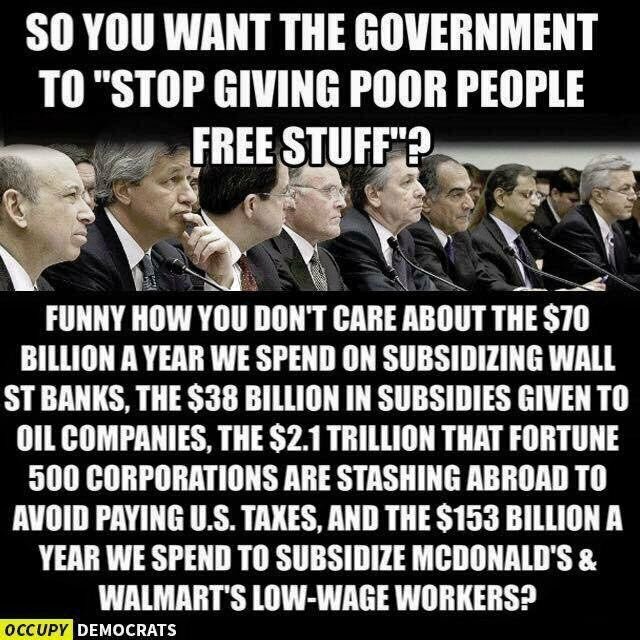 Politicians in all of these countries have taken advantage of the angst growing in the hearts of average working citizens who have been victims of a financial decline with decades long stagnant wages and rising costs, by pointing the fingers at (others) to blame. The other can be any bogeyman. 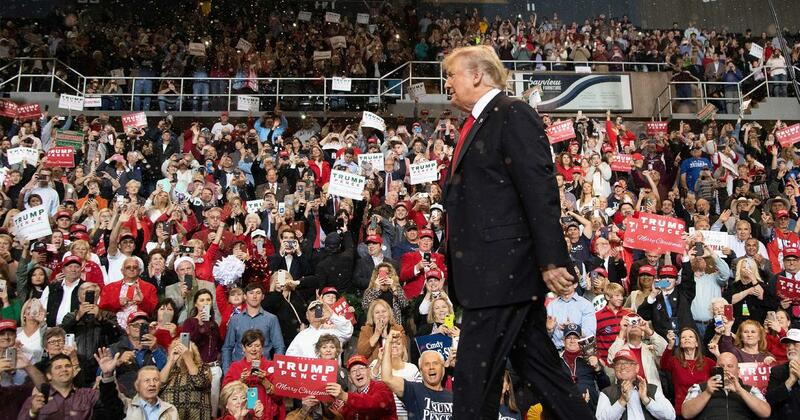 In US, It’s the ‘Dark Money’ GOP donors who are calling the shots of what has become known as President Trump’s Republican Party…. This faction of the republican President Donald Trump’s base of voters is the one with the purse strings. They’re the ones who pushed hard for the 2017 GOP tax cuts bill and regulation reforms that favored corporate interests. 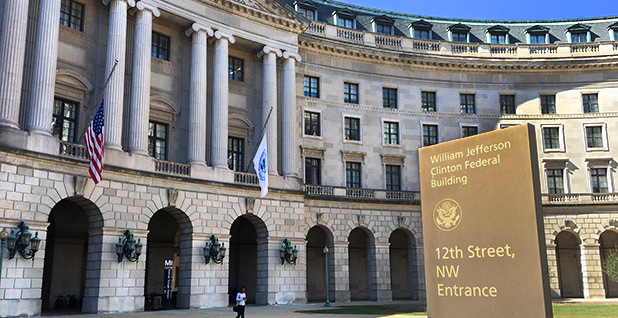 One of those interests, is to have the US government favor the US fossil fuel industry, especially with the elimination of its regulations on its operations and the continued GOP policy of climate change science denial. This faction has joined up with a coalition of voters, including the anti-immigration zealots; Evangelicals as the anti-climate change science, anti-abortion and anti-LGBTQ rights crowd; the racists which include those who are the anti-Semitics and anti-Muslim: and the NRA second amendment enthusiasts. This coalition of dispirit groups are very loyal to President Trump because, frankly, they’ve nowhere else to go. In 2016, the faction of GOP ‘dark money’ donors decided to back President Trump instead of other more qualified conservative candidates because they needed someone who would act in their interests without being hindered with thinking as to what would be best for the USA. 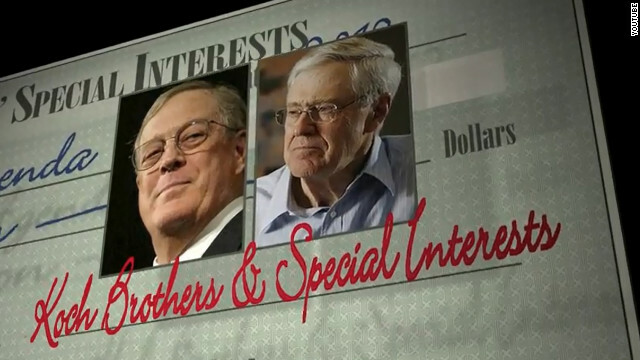 Frankly, the Koch brothers have no where else to go to exert influence over GOP politicians than the Republican Party. 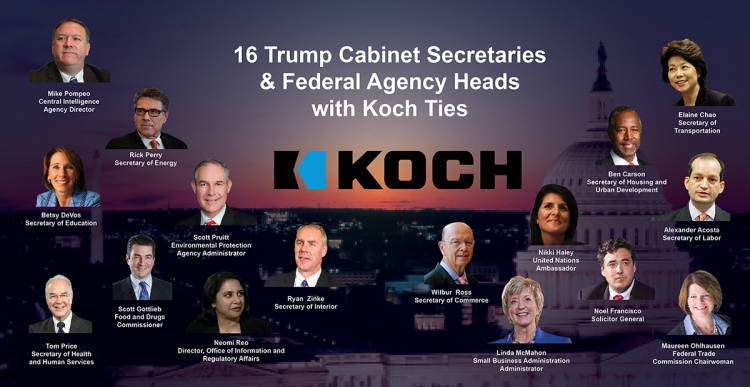 While both parties are at odds regarding current US trade/ tariff policies, the need for an increase in legal immigration, and other issues, President Trump has delivered on just about everything else on the Koch brothers’ wish list. In President Trump’s recent State of the Union address on the floor of the US Congress, I did notice him making comments in favor of increasing legal immigration which is a departure from his past comments and actions on this subject. The Koch brothers and like minded ‘dark money GOP donors heavily favored the 2017 GOP tax cuts bill, the regulation reforms, especially those related to the fossil fuel industry, and the placement of conservative justices on the US federal court system who would tend to rule in favor of corporate interests while backing Evangelicals’ wish to limit women’s access to legal abortions and LGBTQ rights. “Dunlap was hired in October, according to previously undisclosed documents. Since then, he has been extremely busy, having reportedly been involved in high-level meetings that preceded the agency’s decision not to set drinking water limits for chemicals known as perfluoroalkyl and polyfluoroalkyl substances, which “have been linked with kidney and testicular cancer, as well as other ailments.” (In a statement, David Ross, EPA Assistant Administrator for the Office of Water, told the Hive: “Despite what is being reported, EPA has not finalized or publicly issued its PFAS management plan, and any information that speculates what is included in the plan is premature. 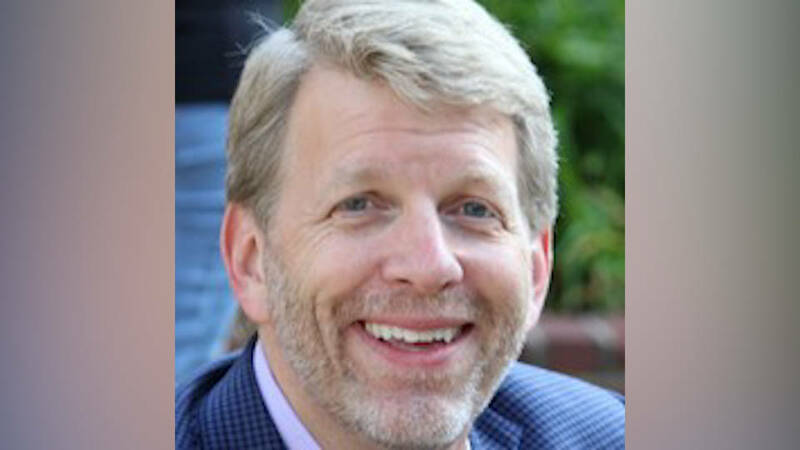 The agency is committed to following the Safe Drinking Water Act process for evaluating new drinking water standards, which is just one of the many components of the draft plan that is currently undergoing interagency review.”) According to Politico, Dunlap has been able to avoid a Senate confirmation hearing in which his prior work experience might come up because Trump has not officially nominated anyone to run to office. (Dunlap’s official bio on the E.P.A. Web site declines to mention any of his employers during his “more than 30 years” working for “private industry, trade associations and as an environmental consultant.”) Currently, Koch subsidiary Georgia-Pacific, a paper and pulp conglomerate, is facing at least one class-action suit related to chemicals now under Dunlap’s purview. The fossil fuel industry, the NRA executives along with some well known conservatives who formed ALEC in 1973. As you know, many of these folks are those GOP ‘dark money” donors who will only back GOP lawmakers who are into climate change denial. 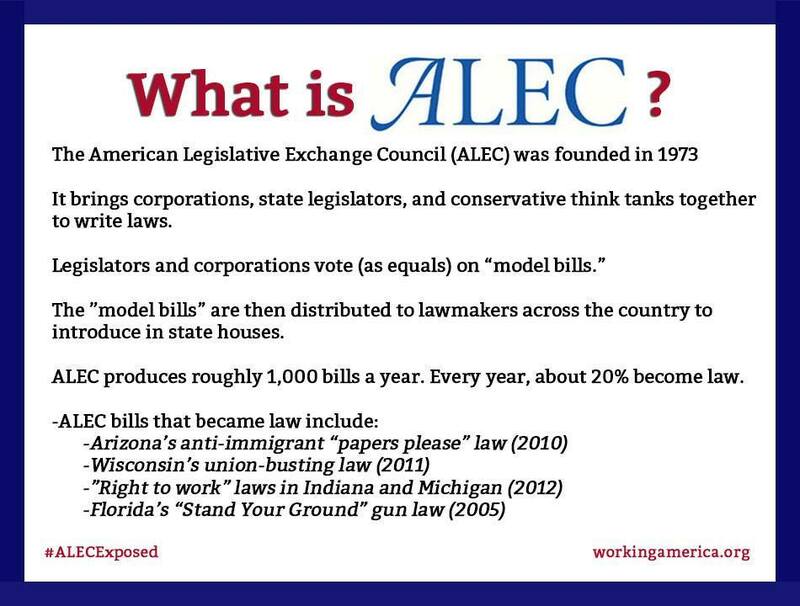 Remember ALEC is the organization that pushed republican led states to pass voter restriction laws. They were trying to slant elections in favor of GOP candidates who would further their interests even if it meant cheating to win. The GOP lawmakers in the US Congress have been bought by these same GOP ‘dark money’ donors. That’s why I’ll be backing Democrats for the near future even though I don’t agree with all their thinking. They just don’t get it do they? This is not their world to play with. In the USA we have entities with out-sized influence on issues like gun control and for addressing head on the reality of climate change. For example, the NRA (National Rifle Association) has such a hold on US GOP elected officials to where they resist passing even the most sensible gun control measure. I’ve been blogging about GOP ‘dark money’ donors’ influence which includes the fossil fuel industry executives, who frankly crack the whip for both the republican president and GOP lawmakers, and so they all live in la la land where they continue to deny the reality of climate change science. This is why, I’m pushing for the ouster of all GOP lawmakers until they and their GOP ‘dark money’ donors get the message, they can’t buy US elections. The power of ‘dark monies’ which means that there are ways for these guys to donate to political campaigns, anonymously with no limits as how much they can give, because of a 2010 US Supreme Court ruling referred to as, ‘Citizens United vs. FEC. Thanks a million for the reference. We need to get the word out that climate change is the #1 existential threat to US national security interests and for the world’s well being.